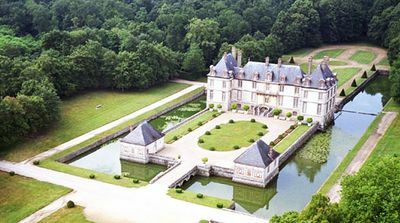 In the heart of a 100 acre estate, 50 minutes south of Paris near Fontainebleau, is found this stately "brick and stone" castle from the early 17th century, surrounded by a moat from an earlier feudal fortress. With its two horseshoe staircases, it echoes the famous Fontainebleau castle nearby. Sophisticated and elegant suites decorated with period furniture.